"Inspire" is an English language online magazine reported to be published by the organization Al Qaeda in the Arabian Peninsula (AQAP). The English language glossy magazine is extremely well produced and is aimed at U.S. and European audiences. The magazine is thought to be the work of Anwar al-Awlaki, an English-speaking cleric and al-Qaeda leader based in Yemen. Awlaki is currently on the United States' "kill or capture" list. 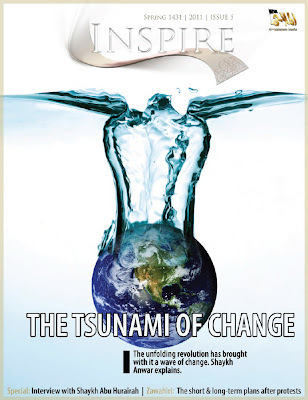 The editorial in Inspire's March 2011 issue, signed by one Yahya Ibrahim, analyzes recent turmoil in the Middle East, and consequences for Al Qaeda, Israel and the West. Al Qaeda sees the recent uprisings across the region as opening up new opportunities to attack Israel. Al Qaeda and the Arabic community or "ummah" plan to "meet" in the sacred Al Aqsa Mosque in Jerusalem. The editorial does not make comforting reading, for those who think "democracy" is "sweeping the Arab world". 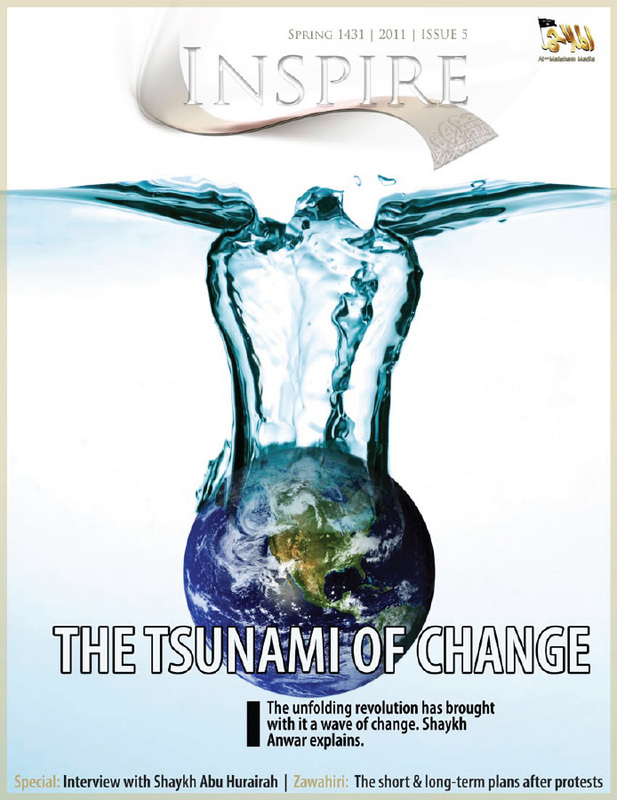 The cover of this issue is about the Tsunami of change that is sweeping the Arab world. With the removal of the despots, the ummah will speak its voice, and when it does, it will chant: Here we start and in al-Aqsa we’ll meet. The biggest barrier between the mujahidin and freeing al-Aqsa were the tyrant rulers. Now that the friends of America and Israel are being mopped out one after the other, our aspirations are great that the path between us and al-Aqsa is clearing up. There could be no freeing of Palestine with the presence of the likes of King Abdullah to the East, Hosni Mubarak to the West and al-Saud to the South. Now that Hosni is gone, we heard the Imam of the Friday prayers praying: “O Allah we ask you to allow us to meet in al-Aqsa,” and the millions inTahrir square roared with one voice: Âmîn. The issue of Palestine is central to the Muslim ummah and now that the masses have spoken, there is no doubt that it will be back to the forefront. The friends of the West are leaving, the issue of Palestine will be back on the table, the preaching of jihad for the defense of the Muslim ummah will be heard publicly in societies that have freed themselves from the tyrants, and we pray that the heavy handed security measures imposed by the despots to keep America and its allies safe and keep their populations terrorized will be over. The West has publicly stated its support for the revolution of the masses. But do they really mean it? Or is it because they do not realize the reality of what is happening? Or is it just because they feel that they must join the bandwagon? The West also believes that the revolts are bad for al Qaeda. This is not the case. Why would the freedoms being granted to the people be bad for al Qaeda? If freedom is so bad for al Qaeda, how come the West has been practicing a restriction on the freedoms of expression when it comes to the message of the mujahidin? Why does the West ban the spread of books and talks of the al Qaeda leadership and in some countries consider it to be a crime to be in possession of such material? Why did the U.S. request from a site such as YouTube to take off lectures by Shaykh Anwar al-Awlaki? Another line that is being pushed by Western leaders is that because the protests in Egypt and Tunisia were peaceful, they proved al Qaeda – which calls for armed struggle – to be wrong. That is another fallacy. Al Qaeda is not against regime changes through protests but it is against the idea that the change should be only through peaceful means to the exclusion of the use of force. In fact Shaykh Ayman al-Zawahiri spoke in support of the protests that swept Egypt back in 2007 and he alluded to the fact that even if the protests were peaceful, the people need to prepare themselves militarily. It is our opinion that the revolutions that are shaking the thrones of dictators are good for the Muslims, good for the mujahidin and bad for the imperialists of the West and their henchmen in the Muslim world. We are very optimistic and have great expectations of what is to come. I hope this editorial is widely circulated. Western military resources are being risked and tax money being wasted to "liberate" Libya. The West has stood by, even offered encouragement, while Islamic and socialist extremists have toppled or endangered several pro-Western, or moderate regimes in the Middle East. These revolutions are not about "democracy". They are about bringing anti-Western extremists to power in every nation in the region. Israel, and other Western nations could suffer horrendous consequences if this madness is not reversed. We should take our enemy at his word. Thank you, Trevor, for combing loathsome materials so that we get the truth. When we sense our politicians are paralyzed -- from the battering we take from the Tass-like media, the Union Juggernaut, activist Judges, and the like -- and we are busy just trying to keep our little lives together, I'm afraid we slip into a type of numb semi-paralysis ourselves. I want to DO SOMETHING, yet have an elderly mother to care for -- which leaves me homebound much of the time. So I make phone calls, emails, etc. If there's something else I can do to help you -- and I'd send more money to you if we had any more of it -- please let me know.